When employees of the Best Places to Work in Virginia talk about what their companies do for them, a lot of interesting perks float to the top. Nexus Services in Verona, which provides services to immigrants in detention, hosts private concerts for its employees. Shows have included performances by the band Fall Out Boy and singers Nate Ruess and Prince Royce. Nexus also hosts a family movie night at a local theater, inviting employees and their families to watch a film with popcorn and free drinks. Free drinks of another type are available at Virginia Distillery in Nelson County. Employees are entitled to a bottle of whisky every month, along with regular tastings. Airrosti Rehab Centers, a San Antonio-based company with centers in Virginia, gives employees and their dependents free treatments. “We fix pain fast,” the company says on its website. If you work in Northern Virginia at the government division ALKU, a national security defense contractor, you can receive up to $7,500 to help pay down your college loan. Also, on Thursdays the company provides bagels. The Arlington Community Federal Credit Union offers a series of celebrations and contests. Its event list includes: a chili cook-off and summer barbecue, Thanksgiving Potluck and Gala, dessert exchange and Halloween soiree, Valentine’s Day celebration, Mother’s Day and Father’s Day celebrations, baby and bridal showers. 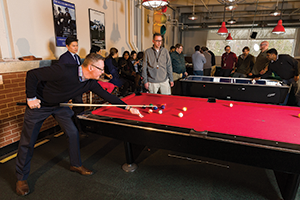 Bart & Associates, a technology firm in McLean, celebrates wins and successes with social and teambuilding events that don’t seem to fit the standard model. To name two, Wine & Painting and Escape Room Murder Mystery. On a more traditional scale, the firm acknowledges a job well done with club-level Washington Nationals tickets, among other thank-yous. At the Business Benefits Group in Fairfax, you can celebrate at the annual chili cook-off and maybe win a trophy. If you stay with the company for your 10th anniversary, the prize gets a little better: a Rolex watch. If you missed breakfast, you won’t have to worry if you work at CBRE, a real estate and investment service firm with multiple Virginia offices. Each morning, fresh cut-up fruit, yogurt, granola bars, bagels and fresh fruit juice are provided to all staff. In addition, the company has a fully stocked coffee bar that includes various coffees, teas and hot chocolate to have throughout the day. In other words, you can skip Starbucks. Want to chill out? There’s a room for that. Employees at Concept Solutions, a technology company in Reston, have access to a room outfitted with pool, air-hockey and foosball tables plus a big-screen TV. It’s always nice to get something on your birthday. At Cortek Inc., it’s even more special. The Fredericksburg-based engineering, technology and security company gives its employees money on their birthdays. Here’s the special part: the money is folded in origami. Endurance IT in Virginia Beach last year took employees and their families to a Hampton Roads Admirals hockey game at the Norfolk Scope. Salty and Hat Trick (Admirals’ mascots) came to say hi. All the kids received goodie bags that included hockey pucks and cowbells.